Arsenal boss ready to sell Mesut Ozil? 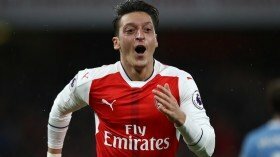 Ozil set for Gunners exit? Arsenal manager Unai Emery is prepared to sanction the sale of midfielder Mesut Ozil with the German having failed to adjust to his style of play. The former Germany international has endured a mixed season with the Gunners and of late, he has been regularly out of the matchday squads with either an injury or tactical reason. According to The Mail, the Gunners boss appears to have made the mind up to permit the player's sale, given the midfielder has struggled to familiarise to his tactics. However, the north London club still have to play the waiting game, considering there are no sides who have made a formal approach to sign the former Real Madrid man. Emery has recently revealed that he has been allocated with no transfer fees for the January window but the potential departure of Ozil could free up funds for the Spaniard to spend this month. Barcelona's Denis Suarez and Dalian Yifang's Yannick Carrasco have been earmarked as the prime targets, though both sides are said to prefer permanent deals at the moment.